We are up at 7:30 and have breakfast in the foodcourt. I have the French toast which is very good. We arrive at Epcot in time for the 9:00 opening. The Leave a Legacy monoliths may not be universally liked but I have to say that I much prefer the new fountain to that old perspex thing which was beginning to look a bit dated. As we walk towards the dancing fountain we are stopped by a CM who gives the girls a Mickey balloon each. Another nice touch. We walk to Test Track for our first ever ride. We practically walk on and strap in for our ride through the test facility. Everyone is very impressed, just the right amount of thrill without being too scary for the little ones. I don't know about you lot but it has my adrenaline pumping. A big hit. On to the Wonders of Life pavilion where Tammy does Body Wars while the rest of us do Cranium Command. I must have seen this at least a dozen times by now but it still makes me laugh. General Knowledge is my hero. The Universe of Energy is next. This is only the second time that I have ridden this since they changed it to the Ellen story line. I still enjoy it, let's face it anything with Jamie Lee Curtis in has got to be good. I'm referring to her fine acting ability, obviously. How could you possibly think I meant anything else? We head towards Innoventions stopping to watch the Jammitors (drumming on rubbish bins) and Kristos (alien acrobats) on the way. Cast in Bronze are about to begin so we find a bench and relax. We really enjoy this as the music is played by a 4 piece band including a huge instrument made up of a large number of bells called a carallon (sp?). It produces a unique sound and, among other things, they play part of Tubular Bells. We are getting thirsty so we head into Ice Station Cool where India tells Grandma how wonderful Beverley is. I don't think Grandma agrees, much to India's delight. Innoventions is next but, after sending an electronic postcard and playing with the games for a while, we leave. It is very easy to spend a long time in here and your time just slips away. The Imagination pavilion is next for the much maligned Journey Into Your Imagination. I suppose one advantage of reading RADP and having everyone telling you how bad it is, has the positive effect of making me feel that this is better than I expected. Nowhere near as good as the original, too many plain areas with nothing much happening, but there are one or two good effects though. Tammy thinks it is better than the old version but this is no recommendation as she hated it. Sometimes I worry about the woman. On to the Millennium Village pausing to catch Off Kilter on the way. The Millennium Village is a great surprise, much better than I expected. In Scotland I play golf and manage to reach the top. What a multitalented individual I am! In Brazil we play football and we toucans trounce the pathetic jaguars. Saudi Arabia is really pretty and the Spirit Oasis is particularly nice. We go through the giant eggs of Sweden which are pleasant but Autumn is a bit of a bore isn't it? Just a few leaves blowing around. We start our snacking and drinking in the food court here with a pulled pork sandwich and coconut cake. What is that about? Where are they pulling the pork from? Or pushing it to? Just one of life's great mysteries I guess. The Israeli simulator ride is down and the second half of the Village is mostly standing exhibits and shops. At the end we play the World Culture Game where Georgia and I get beaten by Tammy, India and Grandma. Now let's be fair, they had superior numbers on their side. They actually are the winners of the whole game which has the added depressing effect of making Tammy all smug and superior. Georgia sulks because India crows about her victory and I sulk just because we lost. I put it down to a sticky button in the vital last round, well, that and the fact that I didn't know the answer but we won't dwell on that. In total we spent two hours in the Millennium Village and enjoyed it immensely. When we come out it has sprinkled with rain. The only time it has rained in a whole week and we missed it! Nice one! From here on in this report is going to turn into a bit of a food and drink rating session. We marked each snack and beer out of 10, which wasn't easy when we came towards the end as every beer tended to taste wonderful! First is the UK. Now I would not be patriotic if I did not give this top marks but the truth is that it was very good. Fish and chips 9/10. Bass ale (for me) 9/10. Dry Blackthorn cider (for the ladies) 10/10. On to France for cheese and French bread 7/10 accompanied by red wine 9/10 while we watch the World Showcase Players perform Cyranose de Bergerac. The girls are at the age where they love watching anything like this. We also buy Epcot Passports for them here and start the epic trek to get them all filled in. 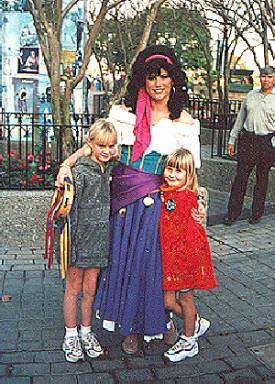 There are several characters in the area including Esmerelda and Clopin. Poor Phoebus is standing on his own with nobody paying attention to him. Serves him right for being named after a sun god. 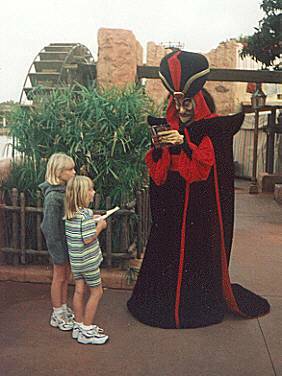 The girls also have a run in with Jafar, who is suitably evil and cruel. Morocco has us sampling Chicken Shawarma sandwich 8/10 and Casablanca beer 7/10. In Japan we have Yakitori (chicken on a skewer with teriyaki sauce and rice) 9/10 and Light Kirin beer 8/10. Italy sees us trying some sort of horribly dry pistachio biscuit 3/10 and Peroni beer 6/10. Tapestry of Nations is just about to start so we stand on the steps by one of the statues to watch it properly for the first time. Whoever thought of this has some imagination. The colours, the lighting, the costumes and the wonderful music are all perfect. We will definitely see this a few more times before we return home. On round to Germany for chocolate sticks from the sweet shop 7/10 and Becks beer 8/10. In China we have Sweet and Sour Chicken, rice and a spring roll 8/10 (5/10 for the spring roll) and Chinese beer 5/10. We spend some time looking around the beautiful shop. There are so many lovely things in here, it is one of the very few shops that I don't mind spending time in. Tapestry of Nations is about to start for the second time at 8:10 so we find a place to watch. The girls love dancing to this and enjoy the interaction with the performers enormously. We find a place to watch Reflections of Earth just to the right of Germany and have a very good view. New Year's Eve was so packed that we did not get to see much of it, so this is our first proper viewing. We have also forgotten Georgia's earplugs, so a crying, unhappy child follows. What an amazing show! This is ten times better than the last Illuminations. The fireworks are spectacular, the music more stirring and the globe is the icing on the cake. Like Tammy said, every time you think it is finished they crank it up another level. We will see this again as I was videotaping some of it and you tend not to enjoy it so much that way. A slow walk out of the park, a quick bus ride back to Dixie Landings followed by a swift entry to bed at 10:30. The girls are both exhausted. I think we need a quiet day tomorrow to recover.